I have this image in my mind. There are the two guys, the cool, young, hip Mac guy and the old, chubby loser PC Geek. They argue for a while then stand there, hand in hand, then… Have you ever seen Bambi Meets Godzilla? Watch it. I love the chord at the end. That’s what I see in my mind, the big Godzilla foot crushes the two guys, the Mac guy and the PC guy. 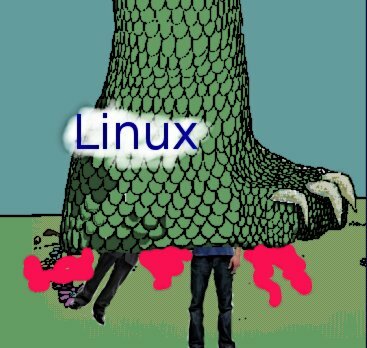 But Godzilla’s foot says, “Linux” on it. The first time I ever gave Linux a shot was… I don’t know, a long time ago – an eon ago in computer time. These were the days when you still logged on to the Internet through a dial-up connection to America Online (I miss the tones of the dial connection and modem negotiation, the comforting hiss of the data stream starting, coming out of the tinny little speaker). I found a boxed copy of SUSE Linux at a thrift store in Mesquite, Texas. The box had a stack of 3.5 inch floppy disks and a thick, confusing manual. It was on the miscellaneous shelf between the used dishes and the mismatched shoes. It cost one dollar. It might have been version 4.2, I don’t remember. That was the first version and should have been version 1.1, but they wanted to give it the number of Life, the Universe, and Everything. That sense of nerd humor is one of the nice things to permeate the Linux community. That old SUSE distribution never ran very well – I think I installed it on a very crappy old 386SX, or something like that. But it gave me a taste and I thought it was cool enough to stay interested and I could definitely get the feeling for the possibilities to come. So a few years later, I built a custom box and decided to put Linux on it. After shopping distributions and trying a few different ones out, I settled on Fedora Core 6. I was ecstatic. My home computing setup was to have two boxes under my desk. One ran Fedora and the other Windows. I could switch between them with a KVM switch, which worked pretty well. I even built a switch box so I could play music on one computer and work on the other. But as time went by, I pretty much stopped using Windows altogether. One by one, the dominoes fell and the Linux Open Source versions of applications became superior to the Windows Junk (plus they were free) and I only used Window for ITunes (to keep my Touch loaded). I would upgrade my Fedora, usually every other upgrade, on through Fedora 13. Especially, once the Live CD spins became common, I would play around with other distributions. I found some of the smaller, lighter distros extremely helpful in fixing or rescuing other people’s crapped out Windows stuff. I built a server (now undergoing rebuilding) for music, file backup, and web hosting and put Ubuntu on it because the current Fedora choked on its odd video setup. Over the years I switched from the desktop setup to a Toshiba Laptop running Fedora and Windows in a dual-boot configuration. Still, I rarely booted to Windows – only for Itunes, Adobe Illustrator (I use The Gimp instead of Photoshop, but still haven’t come around to Inkscape over Illustrator) and Dragon Naturally Speaking. Oh, and streaming Netflix – It drives me nuts I can’t do that on Linux. The other day I cleaned up the laptop, reinstalled Windows (No matter how careful you are, that piece of crap still will eventually get larded up with malware and have to be redone) and moved up to Fedora 15. And it crapped out. I tried and tried and could not get the newest bleeding edge Fedora distribution to work on my Toshiba. Up until then it had loaded and run without a hitch, but it kept freezing up at unpredictable times. I played around with video drivers and such, but realized I didn’t have time for this crap. So I installed Ubuntu 11.04, Natty Narwhal. Not a hitch. So now I’ve switched. I’m still of two minds about Unity, the new Ubuntu desktop, but It’s starting to grow on me. I’ve never been a great proponent of brand loyalty, but in some ways, by switching Linux distributions, I feel like I’ve abandoned an old friend. Out with the old, in with the new. Now I’m an Ubuntu freak. Yee-haw.